It's the internet age, the age of connectedness. Ask Sony or Microsoft about the defining feature of their next-gen consoles, and they will start telling you about "social", about playing together online, all the time. That's all well and good, but does every game need online multiplayer? They do not, argues QWOP-maker and NYU teaching professor Bennett Foddy in a new opinion piece over at Polygon. 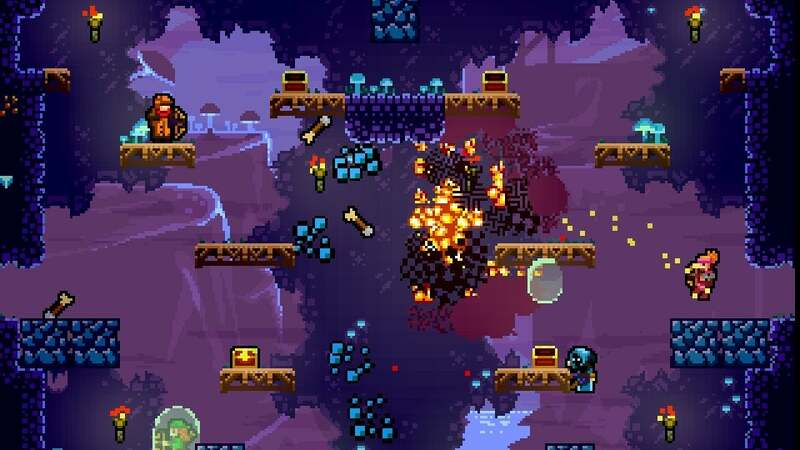 Foddy is reacting to a perceived grumpiness about the lack of online multiplayer in new indie games like Samurai Gunn and Towerfall: Ascension, the latter of which just made the jump to PS4. Foddy — who is also one of the designers of the upcoming local multiplayer game collection Sportsfriends — puts forth an in-depth argument for why local multiplayer will never go away, and the many ways it is inherently superior to its online cousin. He gets pretty technical in places (there's a whole section on lag), and he's sure to say that if you don't have a readily accessible group of friends to play with, there's pretty much nothing a local multiplayer game can offer you. Wii Sports makes the most of what is great about local multiplayer. It lets you laugh at your friends striking silly poses. You find yourself teaching your grandmother or your kid sister how to play. It ropes people in as they walk through the living room. When you get together to play games with friends, the space you're in becomes a ritual space, like the stage at a concert or the altar at a wedding. It's a space where you can trash-talk your friends or howl in defeat, where you can trick people, where you can laugh at their expense and dance on their grave. It's a space where you have permission to look foolish in front of your family members. Importantly, it's a space where you can look up at your opponent's face, lock eyes and dare them to make the first move before your split-second counter-attack. The best local games aren't just offline versions of online games — they are designed to intensify these social dimensions of gameplay. I've recently re-discovered the joys of playing games with another person , of sharing in the thrill of victory and the agony of defeat, even in singleplayer games. As great as it is that our gaming PCs and consoles allow us to be more internet-connected than ever — and it is great, as one gets the sense that game developers are only scratching the surface of what's possible with game-streaming and asynchronous online play — there will never be a substitute for sitting (or standing) in a room with other people, looking one another in the eye, and just playing. Check out Foddy's full essay to get the breadth of his argument. And if you're interested in the notion of offline public and social play, check out Kill Screen magazine's 2011 "Public Play Issue", in which a bunch of writers (including yours truly) explore a bunch of ways to play games while surrounded by other people. Yeah seriously, I stopped playing Forza when they took LAN play out of it. Forcing you to be online to play multiplayer isn't about being good for gamers, it is about Microsoft forcing people onto their paid Live service, even if you have two consoles in the one room. It is about companies using it as a way to prevent piracy. It isn't about giving players what they want. LAN play is so much more fun than online, a few of your mates, the occasional cheat to glance at their screen, throwing controllers at each other, the fun of actual, rather than virtual, human interaction. Online is great when you can't get to a mate's house, but the removal of LAN play from titles, so that the companies can make an extra money grab, really pisses me off. I prefer playing couch co-op games with my room mate or friends, I'm sure plenty of people are in the same situation... The best games? One's that combine split-screen and online together such as Borderlands 2, CoD: Ghosts Extinction and StarHawk... Why not have the best of all worlds, or at the very least give the gamer the option? Good offline multiplayer is a huge thing for me, nothing better than 3 mates and a few relaxing substances. Xbox/ Gamecube it was all Mario Golf, Fusion Frenzy (that corkscrew running game was great) and Mashed. Oh and Worms. Always Worms. Despite Valve's push to bring Steam more into the home console space, there really is a lack of "couch co-op" games on Steam. It also doesn't help that at least HALF of the games with the "Local Co-op" tag have misunderstood the label to mean LAN, so you have to double check games on sites like Cooptimus to see if they've even identified their own game correctly. Towerfall should be a fantastic addition! It really is a shame that apparently most Steam users don't want couch co-op. Local co-op is great, but it's not really available to me. I think a game like TowerFall would benefit from having an online match making mode. It would take a lot more developer effort, and the online game would be different and likely highly inferior to a local game because of the lag and the design compromises that would have to be made to counter that. But it would be a better game for having that option. I do think it's fair to say that it's too hard and that it compromises the vision too much. Those are absolutely reasonable arguments for a developer to make. But lamenting at the lack of a mode that many would appreciate is also a reasonable response from a player and potential customer. Towerfall looks awesome and I want to buy it, but it's clear the game isn't designed for me and people like me. What makes me sad about that is that I believe it could have been. The loss of local co-op and LAN play is NOT a consumer-driven change. It's publishers trying to drive their games into the 'online social space' - both to take advantage of the sales-tail-extending social-pressure (word of mouth, playing what each other is visibly - through facebook - playing), and to combat piracy, by linking as many features and incentives to online authentication as possible. Diablo 2 was a fantastic game to play on a pair of computers with a friend nearby in the home LAN, but Diablo 3 stripped that feature. There was no benefit to people who play this way - in fact there were numerous disadvantages, introducing a reliance on latency, server stability, and fixed accounts locked to a customer as opposed to a disc loaded in the tray for any visiting friend to pick up and join in on. Local co-op can be great, but it doesn't serve the publisher's interests in converting as many games as possible into online-only, so that they can have a tighter grip on customers. Exactly. My stance on this has always been that no matter how amazing a games online multiplayer, it takes nothing to provide the tools to set up local multiplayer or even your own online dedicated matches. Same with MMOs dying without the release of server tools. That tight-fisted deathgrip on the IP is a death-knell for the industry if persisted with, anyway. Some of the greatest games of our generation are the direct results of modding, or their commercial success lies in their moddability. Refusing to let others come up with anything which alters their precious code would see a world without Team Fortress, DoTA/League of Legends, Portal, DayZ, and Oblivion/Fallout3/et al would've been the niche titles Daggerfall was. The crafted experience is a fine thing, but growth comes from experimentation. There's no reason not to provide a curated online experience as an option, but to make it the only option is purely a publisher invention with dollars in mind, not customer experience. There's more factors at play with the design of modern multiplayer than just what the gamer wants IMO.. Not saying that's right or anything, but still - I don't think they're doing it just to be dicks or anything haha..